The black boxes sitting on the desktop make up a GRC-109 system, consisting of a R-1004 receiver, T-784 transmitter and PP2684 power supply. It is crystal controlled, note the crystals spread out on the desk between the radio receiver/transmitter units on the right and the power supply with the meter on the left. While the transmitter has a built-in key, I opted to attach an old military J-47 straight key to make it easier to transmit code. Earphones are used for listening. This unit transmits code only. 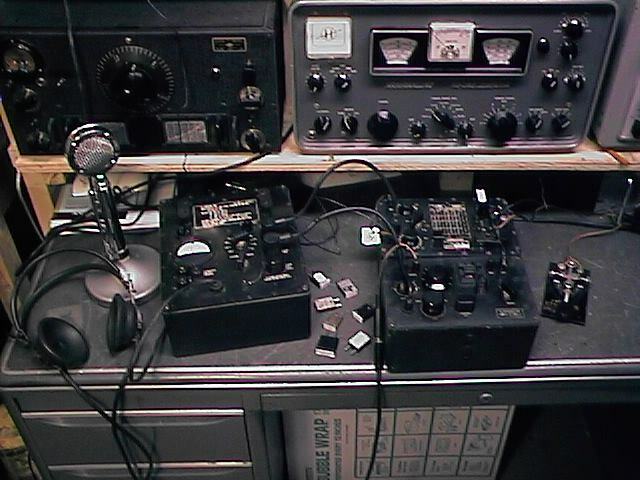 The microphone seen in the picture is a D-104 and is actually connected to the Johnson Viking Invader 2000, the corner of which can just be seen at the right side of the picture. A full view of the Invader can be seen in the main CX 98 picture.